Genmaicha is a traditional Japanese favorite. 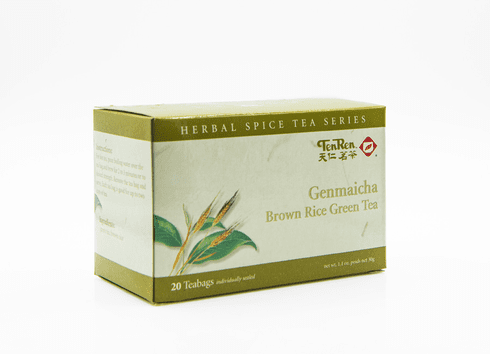 Genmaicha consists of Sencha Green Tea blended with roasted brown rice. Tea steeped from these tea leaves has a light yellow hue. The taste is pleasant with a hint of roasted rice and a mild aftertaste. The aroma is a light scent of freshness and roasted rice. This tea is often consumed in Japan and Japanese restaurants with green tea powder added. Genmaicha may be enjoyed hot or chilled, with or without green tea powder added. Available in boxes of 20 bags. Shipping weight is 0.16 lb. The water used to steep this tea should be about 160-180�F or 70-80�C. Use one tea bag for about every 6 ounces (150 ml) of water. A steeping time of about 3-5 minutes is recommended with more or less time depending on the desired concentration. As a rough guide, the higher the temperature of the water or the greater the amount of leaves used, the shorter the steeping time should be.